With people becoming more and more environmentally conscious, hybrid vehicles are becoming more and more popular. Using less gas helps the earth but it also helps your budget. If you are looking into purchasing a hybrid, you need to seriously consider the Hyundai Ioniq Hybrid. 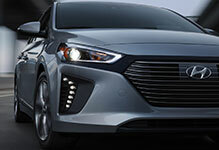 The Ioniq Hybrid, based on EPA estimates as of February 2017, is the most fuel-efficient car in America. Getting you 57 mpg in the city and 59 mpg on the highway, the Ioniq will probably give you better mileage than any car you've ever owned. Being named the most fuel-efficient car in America did exclude plug-in hybrids and all electric cars, but there are also plug-in and all electric versions of the Ioniq available. So, if you want to save even more on gas, the Ioniq has your back. Luckily, you can get a car that is the most fuel efficient in America without losing out on style and space. This hatchback doesn't look like your traditional hatchback. Its sloping rear end makes it look more like a stylish sedan rather than a hatchback. The extra large battery that comes with hybrid cars is positioned below the rear seats so that it doesn't take away your trunk or passenger room like other hybrids might. This space, along with the 60/40 folding back seats, gives the Ioniq Hybrid plenty of room and plenty of options for either passengers or cargo. You also don't need to compromise when it comes to the driving experience. One concern with a hybrid is losing power. The Ioniq Hybrid still delivers normal horsepower for a sedan of the Ioniq's size. The Multi-link rear suspension makes for a smooth ride and responsive handling. 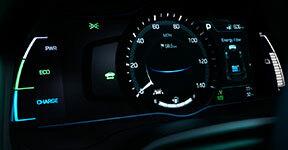 The Drive Mode Select lets you select either Eco or Sport modes to fit your preferences. The D-cut steering wheel, which was first used and perfected in the racing scene, provides greater feel and response. These things all combine to give you the experience you've been waiting for in a car. An attractive part of buying a new car is the warranty. When you have a warranty you can feel confident that, while its unlikely that anything will go wrong, you will be covered if something does. With a Hyundai though, you get America's best warranty. 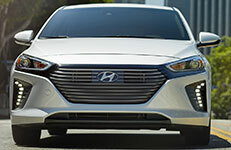 Hyundai's new car warranty last for either 5 years or 60,000 miles. The powertrain warranty will cover you for an amazing 10 years or 100,000 miles. To top it all off, the hybrid battery comes with a lifetime warranty. Its not called America's best warranty for nothing. If you want the Ioniq but on a more luxurious level, the Limited takes you there. The leather, heated seats provide both style and comfort. The power tilt and slide sunroof gives that extra feeling of freedom. The Limited version also comes with Bluelink to give you optimal technological connectivity. This integration feature allows you to connect your smartphone and its apps to your touchscreen. Headlights take a curve with you, allowing your visibility to be as accurate as possible. See all the functions of your vehicle in one place, with color-coded features to make reading them easier. Stay safe and visible with this additional feature. With its smooth and responsive driving, more space than most any other hybrid of its size, and America's best warranty and fuel efficiency, the choice is pretty simple. If you're going to get a hybrid, you need to get the 2017 Hyundai Ioniq Hybrid.